Our open house is upon us! Last years open house was an overwhelming success with over 30 studios open and over 400 attendees. Please join us for another inspiring, memorable, and cheerful event. Over 40 creative individuals open their studios & workshops to the public in a night of art, process, & performance. Participants range from Illustrators to Painters to Visual & Product Designers to Wood Workers to Photographers and Performers. Please join us for food, wine, art and a stroll through the historic North Coast Seed BUILDING and the artists’ studios that inhabit it. 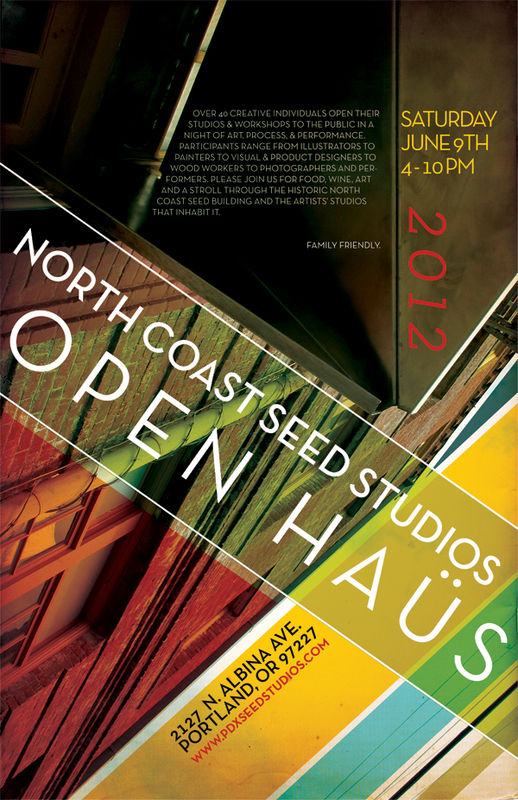 April 24, 2012 | Filed under Events and tagged with North Coast Seed Studios, North Coast Seed Studios Open House, portland art studios, portland open house, Seed Studios.